We work, watch films, read books, listen to music and unwind in our bedrooms. That’s why it’s important to create a fresh and energising place to start the day, as well finish it. This guide will explain how divan beds can help create a fresh and revitalising bedroom by using style and space wisely. Divans are the most popular type of bed base in Britain, and for good reason. Most come with additional storage options of your liking and they’re easy to transport as they ‘split’ into two pieces, allowing for easy navigation of narrow staircases. Plus, they’re great at saving space. They’ll be no wider than your mattress and they all come with additional storage options that lets you make the most of the space available underneath your bed. Sprung top. These come with an extra layer of springs to offer a softer feel under your mattress. 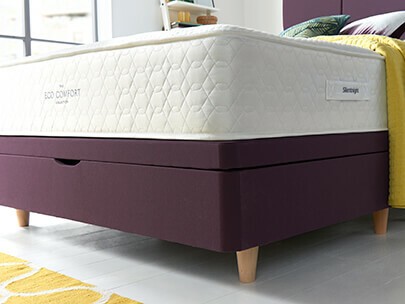 At Silentnight all of our divan bed bases are platform and come with a mattress included to maximise comfort. There are a number of ways you can add a personal touch to your new divan bed. Firstly, most come with a selection of beautiful fabric choices. At Silentnight, we have up to 12 modern and traditional fabric choices to choose from, so you can find the perfect match for your bedroom. Divans come with a lot of room underneath, so you might as well maximise the amount of space available. 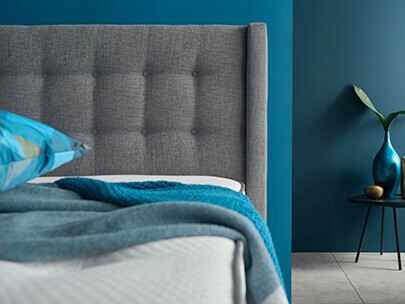 Silentnight offer a host of handy storage options, from single drawer solutions for bits and bobs like tablets and gadgets, to full ottomans that are big enough to store bulky bedding until you need it. They say the devil is in the detail, so it would be a sin to forget those little touches that make a big difference. At Silentnight, you’re able to choose the style of leg you prefer. We offer a wider option in ‘Lime Oak’, or a more traditional, slimmer leg in ‘Beech’. You can also choose what type of base you have, from a deeper base that touches the floor, to a shorter, slimline-style of base. Keep in mind, the slimline base comes with fewer storage options.